In my earlier article I explained the definition of e-waste and the dangers of improper handling of e-waste. Some people may have been left wondering what e-waste categories exist and types of equipments in each category. In this post I present these details. Please follow my later posts where I will be explaining how to deal with each e-waste category while complying with the Environmental Management and Coordination Act (1999) and EMCA Amendment Act (2015). The National Environment Management Authority published the “Guidelines for E-waste management in Kenya” (NEMA, 2010) where the categories of e-waste are explained in great detail. These are explained as shown below. Mainframes, personal computers (CPU, mouse, screen and keyboard etc), laptop computers, printers, networking equipment, scanners, mobile phones, CD / DVDs / floppy disks, UPSs, radio sets, television sets, video cameras, video recorders, Hi-fi recorders, audio amplifiers and musical instruments. Photocopying equipment, electrical and electronic typewriters, pocket and desk calculators, facsimile and telephones. Refrigerators, freezers, washing machines, dish washing machines, cooking equipment, microwaves, electric heating appliances, electric hot plates, electric radiators, electric fans, air conditioner appliances, exhaust ventilation and conditioning equipment, large appliances for heating beds, rooms and seating furniture. Vacuum cleaners, carpet sweepers, water dispensers, toasters, fryers, appliances for hair-cutting, hair drying, brushing teeth, shaving and massage; electric knives, clocks, appliances used for sewing, knitting and weaving. Equipment for turning, milling, sanding, grinding, sawing, cutting, shearing, drilling, punching, folding, bending or processing wood, metal and other materials. Tools for riveting, nailing or screwing or removing rivets, nails, screws or similar uses. Tools for welding, soldering or similar use. Tools for mowing or other gardening activities, sewing machines etc. Electric trains or car racing sets, hand-held video game, video games, computers for biking, diving, running, rowing, etc. Sports equipment with electric or electronic components. Fluorescent tubes, compact fluorescent lamps, high intensity discharge lamps, pressure sodium lamps, metal halide lamps, low pressure sodium lamps and any other lighting or equipment for the purpose of spreading or controlling light with the exception of filament bulbs. Scanners, operating electrical equipments such as stethoscopes, radiotherapy equipment, cardiology equipment, dialysis equipment, pulmonary ventilators, nuclear medicine equipment, laboratory equipment for in-vitro diagnosis, analyzers and freezers. Other electrical appliances for detecting, preventing, monitoring, treating, alleviating illness, injury or disability. Automatic dispensers for hot drinks, for hot or cold bottles or cans, for solid products, for money, and other appliances which deliver automatically all kind of products. Smoke detectors, heating regulators, thermostats, measuring, weighing or adjusting appliances for household or as laboratory equipment and other monitoring and control instruments used in industrial installations. Lead, Nickel and Cadmium batteries etc. 1. From the list of categories, equipments and appliances itemized, what e-waste do you have at home that require appropriate disposal? 2. 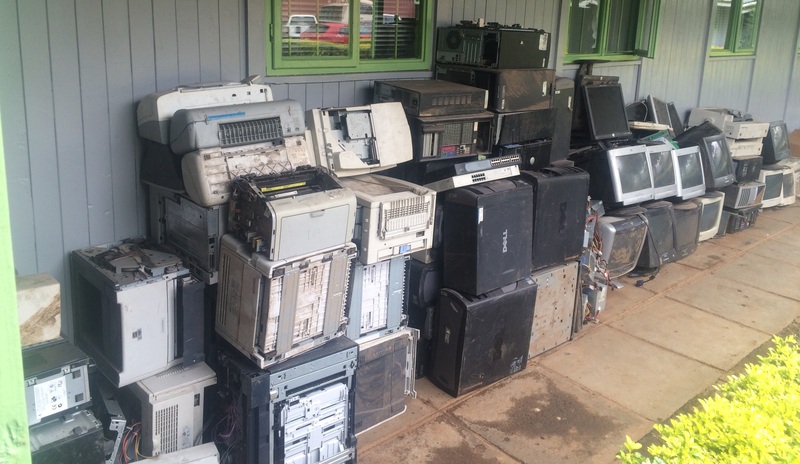 Have you witnessed any e-waste disposed improperly within your vicinity? 3. What are the hazards associated with improper disposal of the e-waste in your custody? 4. Where are the appropriate disposal sites within your region for the e-waste? To make your suggestions work, we need an organisation to create a business to receive, break down the items, and sell the useful materials. This organisation needs to offer some reward for delivering the waste items. I wish you success in getting such a business going. Waste disposal management and recycling offer great prospects for development. ON that path important is global sense of population and willingness to separate garbage by type in different bins. Sorting of garbage is should be done with proper bins, if not damage to the environment can become huge. Leaking containers have big impacts on waste disposal locations.